The fourth issue of Literacy Lava, a free pdf for parents or anyone who wants kids to love reading, writing and communicating, is now available from my website. Clicking on this link will take you to the exact page where you just have to click the cover of Literacy Lava 4 to download it as a pdf. 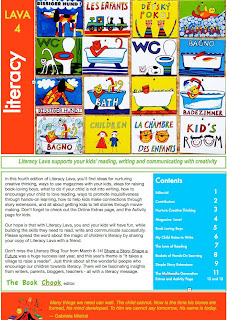 In this fourth edition of Literacy Lava, you’ll find ideas for nurturing creative thinking, ways to use magazines with your kids, ideas for raising book-loving boys, what to do if your child is not into writing, how to encourage your child to love reading, ways to promote inquisitiveness through hands-on learning, how to help kids make connections through story extensions, and all about getting kids to tell stories through movie-making. Don’t forget to check out the Online Extras page, and the Activity page for kids. Admittedly as editor of Literacy Lava I might be prejudiced, but it seems to me there are such great articles yet again in this issue. I hope you'll take the time to read, tweet, and send the link to anyone you think would find it useful. Literacy Lava - get it while it's HOT! Looks wonderful, Susan! I'm sorry I didn't contribute this time around. I hope to erupt a new article for the June issue. That's wonderful news, Dawn! Meanwhile, thanks so much for supporting Literacy Lava 4. THIS is awesome! I love it! Thank you! Love getting feedback, Kelly, thanks! Susan, it is great, thank you as always! And I love the button for SAS, looking forward to next week! So sorry you and your fellow citizens can't help RIF with our own US Congress, we're staying busy at RIF on this funding issue. I have two new readers (just started school this year) and really enjoyed the literacy lava articles and ideas... as a preschool teacher I am really enjoying taking the next step into literacy learning along with my girls! Excellent resource, thank you for sharing it! Carol, if my earnest wishes and caring thoughts count, you have them. How lovely, Kate! Thanks so much for the feedback. We'd love to hear if you have a request for an article too. Glad you like it, Kelly!